CambridgeIPâ€™s analysis of the densely populated graphene patent landscape reveals a surge in patent activity from 2007 by major corporations, leading nanotechnology research institutes and SMEs around the world. Grapheneâ€”the first 2D crystal discoveredâ€”possesses highly unusual electronic, optical and mechanical properties, and is of interest across industry fields as diverse as semiconductors and biotechnology. CambridgeIPâ€™s IP Landscape research confirms that graphene technology systems can be complex, relying on other technologies and processes.Â Our work also reveals that many of the end-use sectors for graphene are relatively patent intensive.Â These features of the technology space contribute to the formation of a complex and intense patent landscape. In addition to our work assisting policy makers, major investment groups, VCs, service providers, academic research institutes & individual inventors, CambridgeIP has produced a series of IP reports inspecting Corporate and University patent activity, and exploring the â€˜disruptiveâ€™ implications of graphene across a range of technology fields. Who are the most prolific graphene inventors? 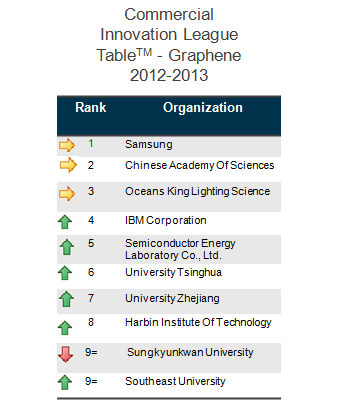 Which are currently the most important graphene patents? 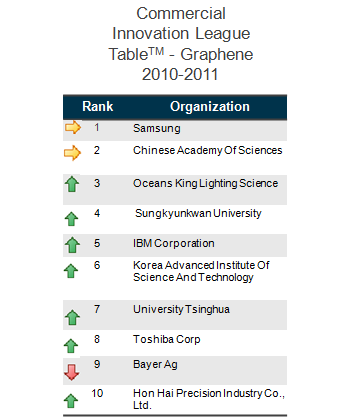 What are the most recent patented graphene innovations about? What to watch for in the graphene patent landscape? Additional recommendations and conclusions arising from the graphene IP LandscapeÂ® are provided. CambridgeIPâ€™s graphene IP strategy, IP Landscape and IP policy work and the opinions of our experts have been covered by leading media. Our graphene patent research has been covered by Nature Materials and our Chairman, Quentin Tannock has been interviewed about the graphene IP Landscape by leading media publications including Nature News, Nature Materials and the Financial Times.Â Click hereÂ for more information on our grapheneÂ press and media coverage.